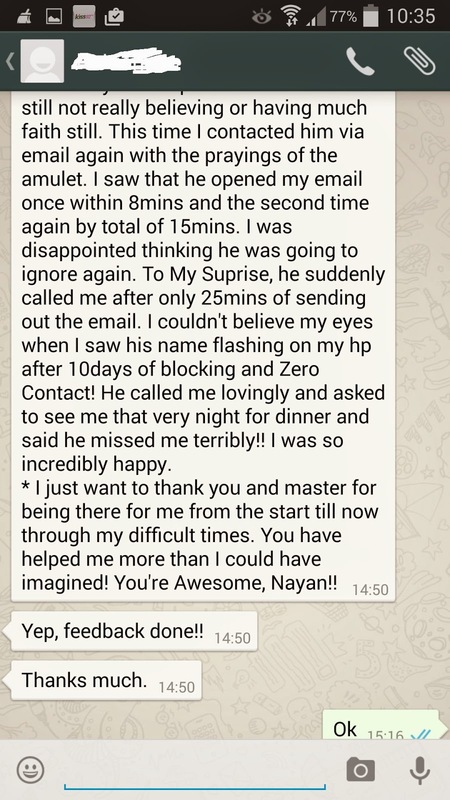 Nayan, this amulet in particular is superrr amazing! My guy had M.I.A for a week plus. I was very upset and desperate. All my calls, sms and whatsapp were blocked. Only my emails to him were read but being ignored by him. Our relationship was complicated plus I had a court case against him which was on-going still. Looking at our circumstances, I hadn't much hope of "pulling" him back at this particular time, but as in the past, you had always been there for me and assured me that it will work. I held this latest amulet you passed me and followed your simple instructions. But still not really believing or having much faith still. 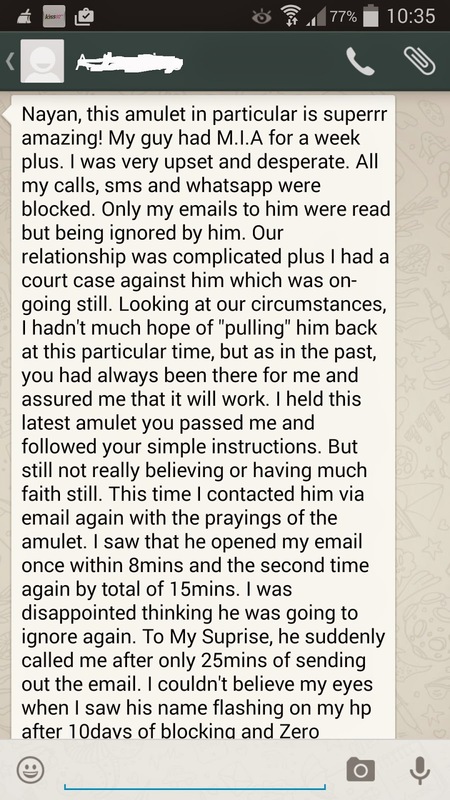 This time I contacted him via email again with the prayings of the amulet. I saw that he opened my email once within 8mins and the second time again by total of 15mins. I was disappointed thinking he was going to ignore again. To My Suprise, he suddenly called me after only 25mins of sending out the email. I couldn't believe my eyes when I saw his name flashing on my hp after 10days of blocking and Zero Contact! He called me lovingly and asked to see me that very night for dinner and said he missed me terribly!! I was so incredibly happy. * I just want to thank you and master for being there for me from the start till now through my difficult times. You have helped me more than I could have imagined! You're Awesome, Nayan!! 面对着我们的处境,我根本不敢在这个时候 抱任何希望把他"拉"回来了. 不过, 因为以往你都一直在帮助我也给我肯定一定行得通. 我拿着最新的佛牌,照着你的指示做. 不过还是带着一点怀疑与不肯定. 这回, 我带着对着佛牌的祷告,又再次发了一个电邮给他. 我看到他在八分钟内阅读了,而第二次在十五分钟内. 我又失望了以为他又是会不理我. 出乎意料, 他突然打电话来, 在发出电邮后的短短二十五分钟内! 经过十天的彻底无联系, 当我看到他的名字显示在我的手机时,我简直不敢相信.